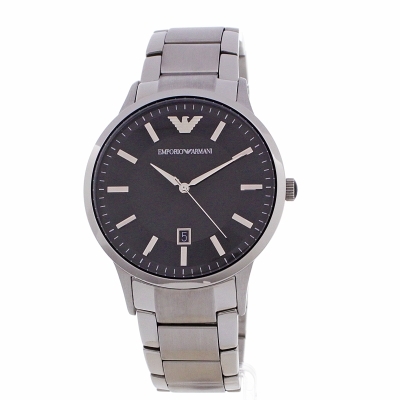 Men's Emporio Armani watch in a very attractive, sleek design. This model is made from stainless steel and has a round case. 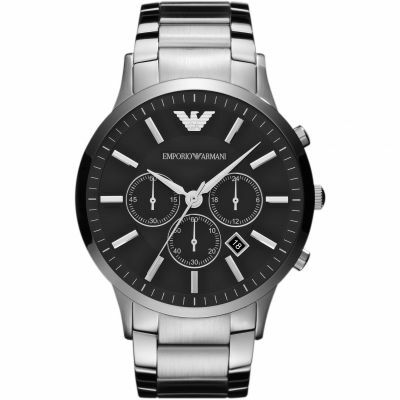 The high-visibility dial in black features silver baton hour markers with the Emporio Armani logo at 12 o'clock, slender silver hands and date function. It fastens with a stainless steel bracelet and powered by a quality quartz movement. Perfect Design and Quality Watch, Even more Beautiful in Hand!!! It is exquisite. Its color and design are elegant. I as very happy with the product, looks even better in person than in the pictures. I really like the simple design and the black face, ideal for smart occasions and everyday use. Really good quality product! Bought this as a gift for my boyfriend, perfect everyday watch. Arrived really quickly and no charge for delivery. 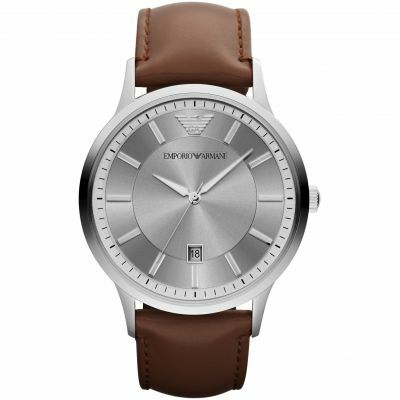 A stylish, comfortable and elegant watch with the high quality expected of an Armani item but not overly high maintenance. 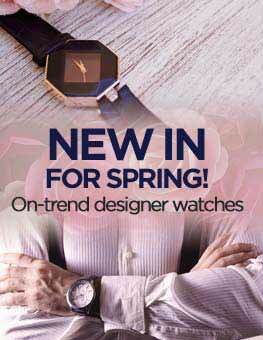 Prefect for those starting their watch collections and looking for the all round watch for every occasion. I bought this watch as a present for my teenage son. He loves it and it looks great. The style colour, quality and thickness are great making it excellent value for money. My only criticism We had to have some links take out as the watch has no half links on it, the watch is a little too big, taking another full link out would make it too small. Providing a half link with the watch would have made it perfect. Stunning looking watch bought for my fiance as a present and he was thrilled with it. Love the black face of the watch against the shiny silver it really stands out and makes it pop . 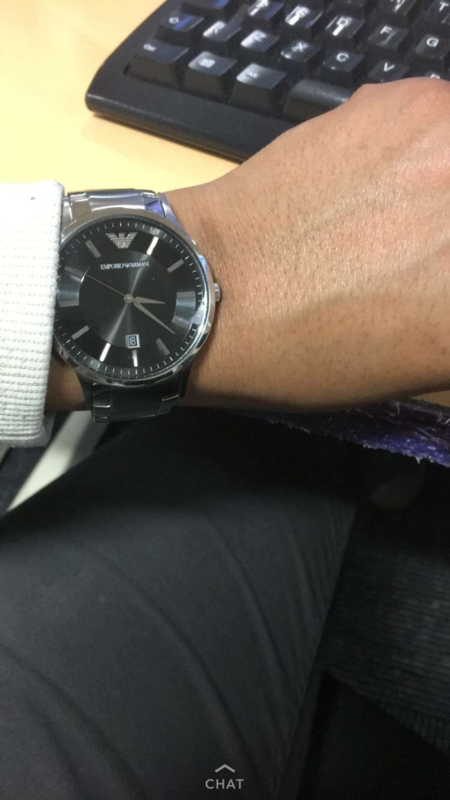 Fiance doesnt normally wear a watch and he said it feels comfortable to wear. He has had lots of compliments saying it looks really nice and looks expensive. Thrilled with this purchase would definitely recommend! Superb watch, fits really well and looks the part. Really pleased with the order and looks better than the photos as well! Delivery arrived in less than 24 hours as well. 10/10. Watch arrived next day which was fantastic, Ive bought from watch shop before and always receive excellent customer service. Products are fantastic exactly as described. Ill have a very happy boyfriend come Christmas day. Great style with equally great durability. Perfect quality for a low end watch. Great watch, I recommend it 100% ! the delivery was very quick and 100% pleased with the service, i hope my boyfriend loves his present as much as i do. Very pleased with the look of this present that I bought. Excellent service, ordered on sat - came on Monday. An excellent product. It arrived quickly and was well presented. Great quality, was purchased in November for a Christmas present for my boyfriend, who absolutely loved it. Very lightweight and stylish. However, the clasp on the wrist strap has locked and he cannot close it. Im currently waiting on response from watchshop as this watch has a years warranty. This was a Christmas present for my son. He chose it based on the style. He was delighted with it. Loves the fact that its not too chunky yet looks like a quality item. Nice, smart watch that is lightweight and has a good fit. Thrilled with the watch,competitively priced, easy Web page, efficient service.Very Happy overall. Brought this for my partners birthday he loved its not too much but sophisticated simple look goes well with causal wear and his work suits I love it on him its a great gift at and affordable price. Love it would definitely recommend this watch. I am a 14 year old boy and have saved up my money to purchase my first watch myself. Of course with being a young chap style is of the essence and this watch is certainly it. Not over-priced and the fit with me being young and having skinny wrists i can report is not hanging off my wrist - excellent watch and I am now the envy of all my non-working mates. Fresh and shiny it looked really good once I opened the box. The features of the watch and box are wonderful. I found the whole Watchshop experience very easy from start to finish. I was worried about ordering an expensive watch without seeing or trying on and to find out watchshop will alter the size before sending out was fab. The watch itself is gorgeous, the watch is a good weight and the face is so clear. My son struggled a bit with the fastening at the beginning, which I also found difficult but after a few goes he can do it easily now. He loves it and it looks like an expensive watch too. bought this for my husbands, he liked it! he said, this watch is very comfortable and light weight. we fixed the braclet in a gold smith shop and its free. amaizing service indeed. The watch is excellent. that was to quick delivery and product was in very good condition. Five stars. Excellent service and delivery! Arrived sooner then expected, a lovely watch. Very smart for a daily look, at the best price found online! Thank you so much! Excellent watch, stylish and sleek. Looks amazing!! Love it !! Lovely watch bought for my sons birthday and brilliant fast service. the item I purchased was a gift for my sons 21st. Exactly what he wanted, not complicated, silver strap and a black face, not to much detail, was requested. I found this watch perfect and he loves it. I here recommended the watch shop to all my friends too. i am pleased with my item which i purchased for my fiance!!! great service would definitely otder again!!! Lovely watch and genuine product, well packaged in a well designed box. 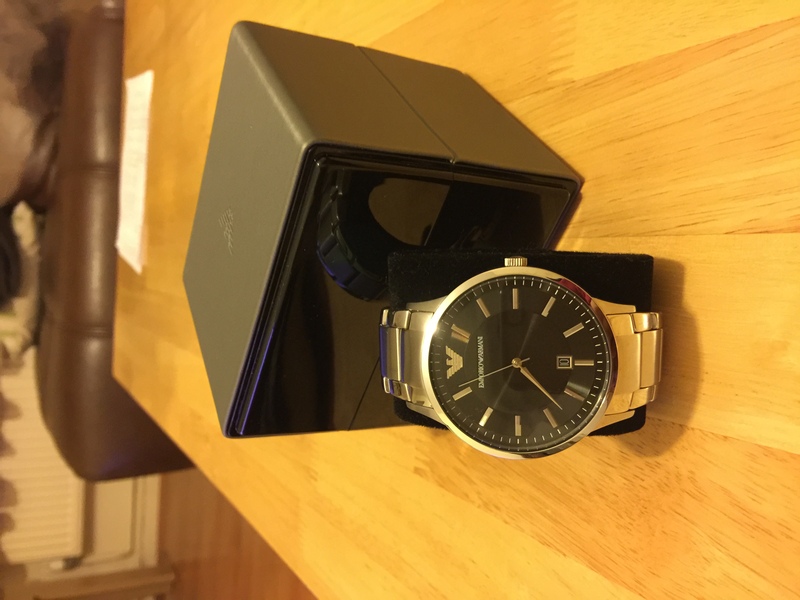 The watch looks stunning and just the correct size, having never used the Watchshop before I would recommend them, you can even track your package from being selected to delivered 5 star service. 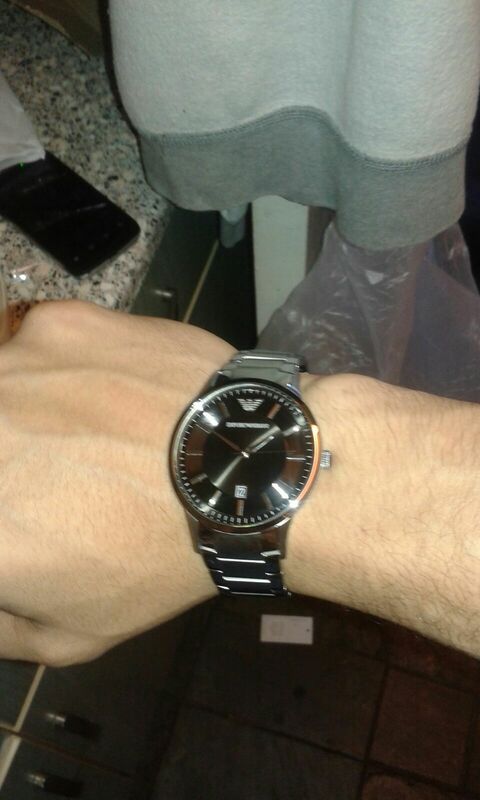 I bought an Armani watch from watch shop and gave them my sons wrist size, watch came and fitted perfectly. Quality of watch was excellent and so was the price, customer service was also helpful when I called with a few questions. I will buy from watch shop again. The watch is very stylish. Simple and elegant. The watch I purchased was of very high quality, I am very pleased with the product and the services I received. The watch was delivered well before I expected it which was great, also the packaging was good, it protected the product well. 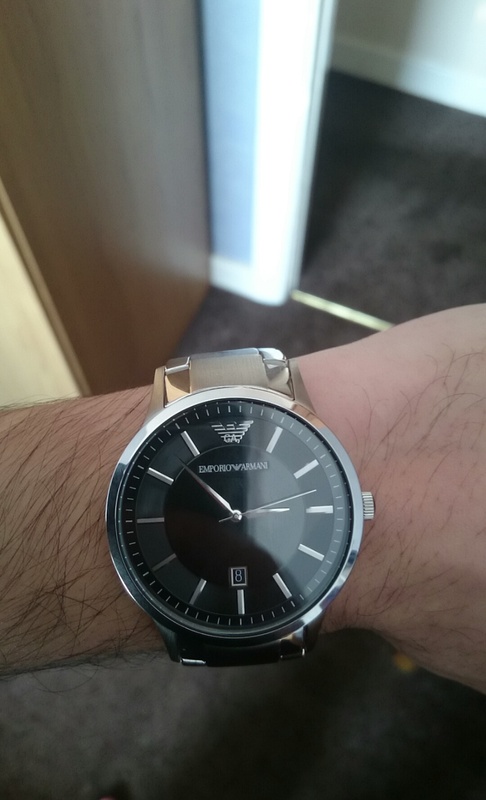 It fits my wrist perfectly and Im having no problem with it so far, definitely recommend the watch great buy. Thanks very much. Amazing product. Swift delivery. Well packaged and an amazing present. This watch has the real wow factor. I bought this watch for a present and the box itself made a real statement before the watch had even been seen. My partner wanted a simple design and I felt this was simple yet classy. I would highly recommend buying this watch! Bought this armarni watch for my sixteen year old son and was over the moon with the service I received! The watch was a huge success. He was so impressed and I was with the price! He has had so many comments.. I wouldnt hesitate to do business again. Thankyou. This is for my husbands birthday. Im sure hell like it as much as I do. Nice and slim looks great on. Bought as a present for a mates 50th birthday so hes not seen it yet. Hes has always admired my watch the same one so I decided to get him one as youre only 50 once. Bought watch for my sons birthday - prompt delivery service well packaged up. Lovely watch really pleased with it. Great service, quick delivery and terrific watch. My son was very pleased with it. Classy. 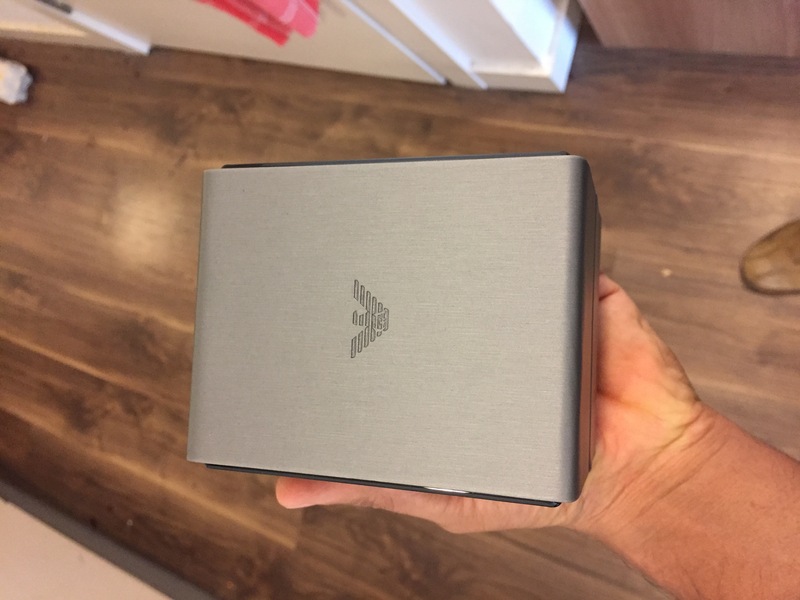 Really nice watch, got it for my boyfriends birthday, good customer service quick and responsive the watch itself comes with original packaging with proof from Armani themselves. Would definitely recommend this product! Bought this watch for my other half for his birthday.all I can say I was over the moon with it.the fit was abit big as he only has skinny arms had to have two links taken out.but that was not a problem.its an ideal watch for all day or going out.it is lovely on sits lovely on his arm.i looked at a few watches but this was my first choice and I went back to it as I couldnt find anything like it. 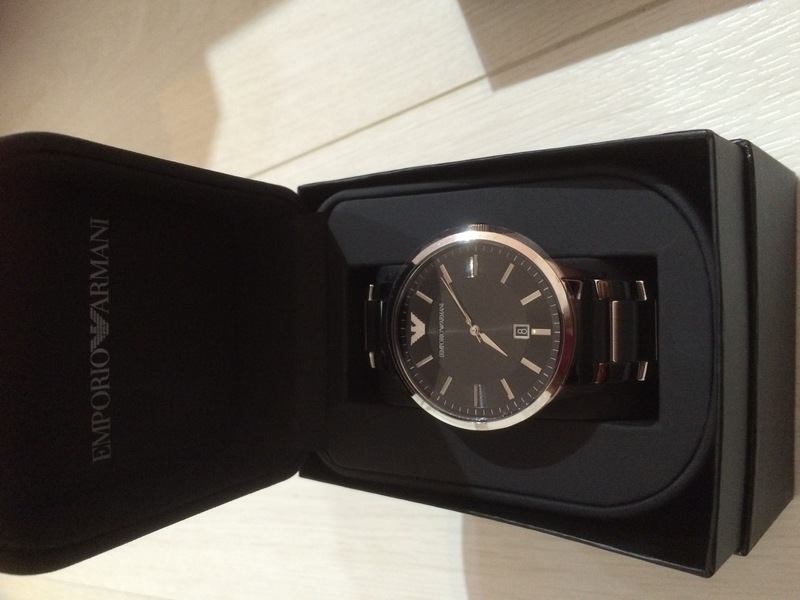 Purchased the Armani AR2457 as Watchshop offered the best price! The watch arrived and I was not disappointed it was well packaged and the product itself was of a high and quality standard. The watch offers a sleek and smart appearance so you can wear this on a formal or informal basis, heavy to hold which again reinforces its value for money. Without a doubt If you are looking for a new watch and want something that will get noticed but wont break the bank then 100% this is the one for you! The watch is as described, and is perfect for all occasions. Really happy with the service provided. The time piece is brilliant, not my favourite type of link but the face is excellent and catches the light very well and the simplicity of the face gives it that extra touch of class. The black and sliver work well together and the sliver really boldens the back face but I did have to take some links out as it was a like to big but that was expected. Overall, a great watch at a great price. Received the watch very quickly. Especially it being a busy period! I had no idea which kind of watch a teenage boy would like so hey ho I typed it in google! Amongst the watches that were displayed this particular one caught my eye. It was stylish ,sophisticated nicely designed and best of all reasonably priced! I ordered it and received it the next day . Honestly the online picture did it no justice it was so much better in real life. My son really liked it aswell so all in all a win win situation. Loved it !!! Bought for my man and is so very classy - just ideal present for your best man ! Once my watch came I was very happy but I had to order 2 watches as the first watch came as not described. refund was quick. 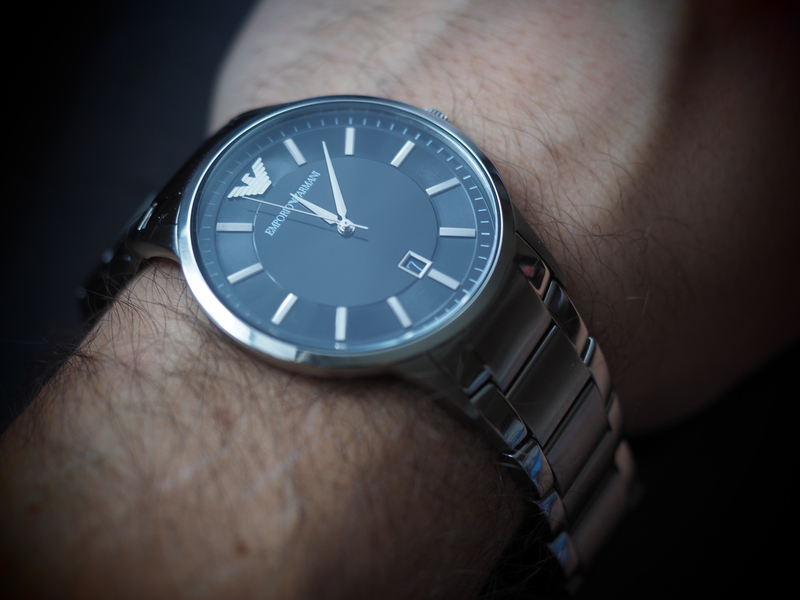 A great, stylish watch, very good value. The watch is better than depicted and my son loves his Christmas present. The large watch face and heavy bracelet suit his style. A goegeous watch, bought for my son for christmas. Arrived in store exceptionally quickly. Looks very nice on his wrist. Plain but thats what he wanted. Highly recommend the site for delivery and speed. Great slimline watch & a super service from order to delivery. Excellent service, the watch is perfect our son loves it. Cannot fault the speed of arrival or the helpfulness of the staff at Goldsmiths when we collected it. Adjusted the strap and beautifully wrapped. Im very happy with this watch. Brilliant quality. I bought this for my boyfriend from Christmas and he loved it! It is a very classy and stylish watch that looks like it wont date. Considering it is metal it is a lightweight watch on and is very comftable to wear on a daily basis. I would recommend this watch to any lad, it is definitely a good purchase! Also the service was excellent and arrived very quickly considering I ordered so close to Christmas. Very good service, the item arrived in the exact time period that was stated, and the gift wrap was a very nice finishing touch. Bought this for my son. Arrived quickly and was in perfect condition. A very elegant smart watch that makes a statement without being over the top. Even the box is sleek subtle and all this for a geat price. Its a good watch and a very reliable one. Not regretting my purchase at all and very pleased with it. I have purchased from this watch ship before and yet again another beautiful watch received. Good description and exactly as it shows on website. Prompt delivery and collection from my local goldsmiths boutique store and they even took out links after xmas free of charge. Great service all round. Will use again and would recommend. 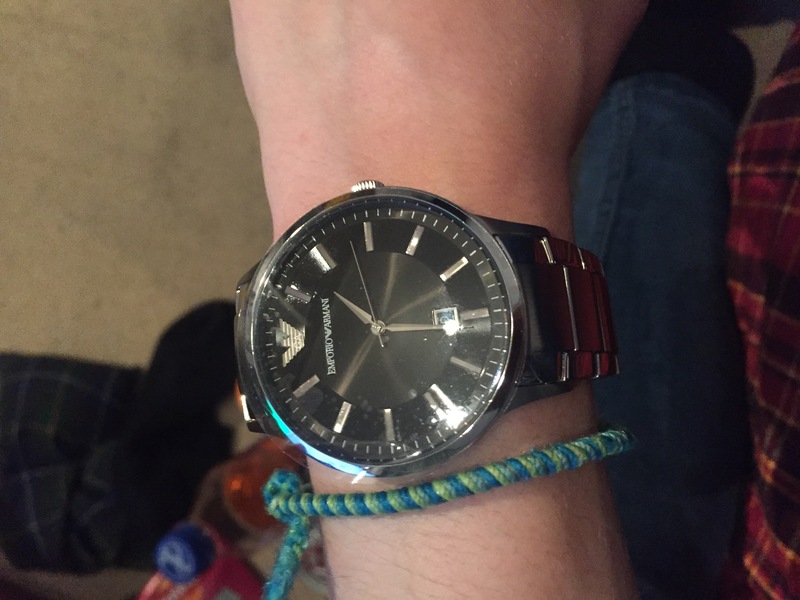 Lovely watch, classic design, it was for my son whos got skinny wrists so had to take 4 links out, no problems at all, nice fit. Bought this as a Christmas present for my son. The wrapping was great very stylish. The watch was just like it was in the picture, very nice. Arrived within two days .Packed really well and in a lovely box . I didnt realise that they would have altered the strap before dispatch until after Id ordered it , which I would have used this service . As this is a birthday present and I havent given it tothem yet Im not sure of the fit, but you can use the service of a named jeweller to get it altered . Its a beautiful watch and a really good size . I think the recipient will love it . Would highly recommend this watch its a great gift. Fast delivery, great packaging and lovely watch dad very happy with it!! Good watch fast delivery but bracelet was not altered although service was offered so very disappointing .now have the added inconvenience and cost of getting it altered . Fantastic watch at a great price. Ordered as a present for Christmas for the Mr. I must say it looks very good and looks a very expensive watch. Overall I am pleased with the purchase, lets just hope the Mr likes it when he opens it on Christmas day. 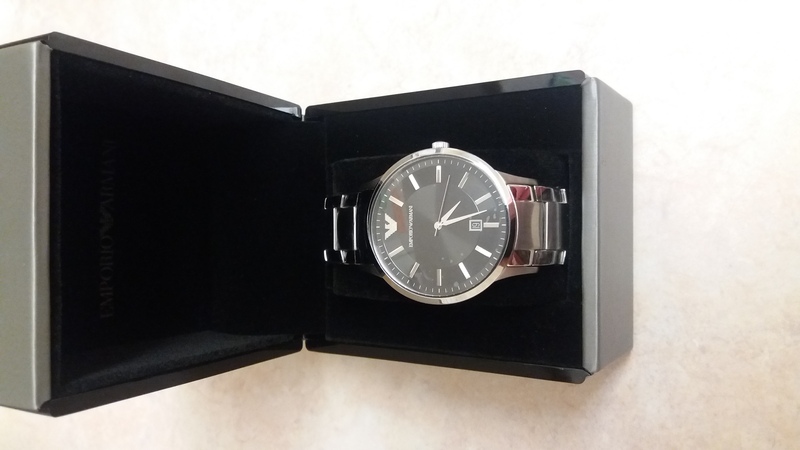 really pleased with the watch, and Im sure my husband will like it as well when he opens it on Christmas day. Such a beautiful watch for a very small price. Bought for a gift for my fiance who absolutely loves it. I will definitely be shopping here again. I was amazed at the level of service given by the watchshop. My item was delivered the very next day and was perfect for my Son. A fabulous looking watch that oozes class. Very happy Mummy who will have a very Happy Son on Christmas day. I love this watch, it came safely packaged and nothing was able to damage it during transport. I like the style of the watch its self and the company were attentive to the point where they informed me on when the order had been processed, picked, dispatched, tracking information and when it had arrived!! Very pleased with this classy looking watch just the right size sits well on the wrist colour as it looks on picture. Value for money very happy. Bought this for my friend for work and he loved it! Would recommend, great price. Excellent service, ordered on Monday arrived all the way from UK to Switzerland on Wednesday, cant ask for anything better. I bought this as a Christian gift for my boyfriend, he absolutely loves it he said that the watch is very elegant looks stunning and looks expensive as well. Ive added the gift box and the note that really topped up all the points for me. Really amazing service is the second this I use this service and I must say is great and I would recommend it to anyone . Quality is as good as it is advertised. Perfect for a meaningful but not bank balancing robbing gift. 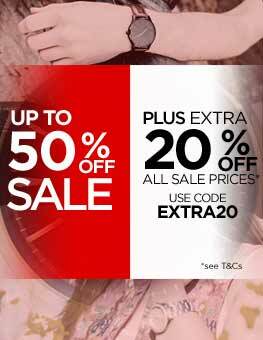 As with most watches they are very large fit so if you are a skinny being you will definitely need to have the size reduced from a watch specialist such as Timpsons. I have bought this watch for my son for Christmas. Lovely watch I am sure he will love it. Great price and quick delivery. Most impressed. The watch looks lovely and service was quick, however it is for a Christmas present so cant review for or after sales service at Golfsmiths yet. 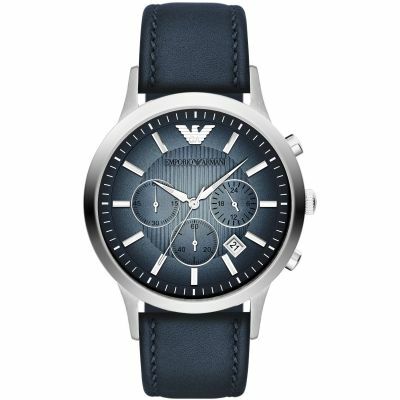 Great watch from Armani! Bought one a couple of years ago for my son and liked it so much bought one for myself! Simple clean looking watch without all the fancy chronograph stuff on it. Feels solidly made and keeps time well. I also like the dark watch against the silver body and strap. Excellent watch Im so happy! Looks so classy and a lot more expensive than it is, the chrome on the bracelet makes it look brilliant. Very very happy with the watch, and also the packaging is brilliant! 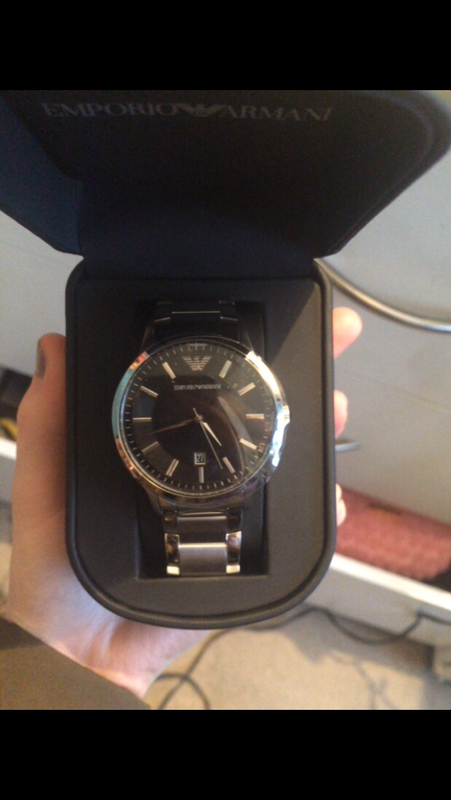 Postage was also quick, cannot complain about anything for this watch, perfect! The product is a good size like the exact same as the photo. Its good quality and looks a lot more money than advertised. The only think is the strap is too big - however this may be good for others. The watch has a shimmery black background when it catches the light, it has a very smart looking silver chain for our wrist and the watch casing is a nice silver. This is the second time that I have bought a watch from watchshop and yet again, I was very impressed. The delivery was next day as promised at a decent time and the watch itself was packaged brilliantly. I know that this will be the perfect present for my partner for Christmas. It is simple but classic and a brilliant price. Great looking classic watch. Simple is, in this case better. This looks even better in real life than it does in the picture. The black/silver contrast compliment each other perfectly. The watch strap looks quite big, but WATCHSHOP have already confirmed I can take it back to where I collected it from and have some links removed. Either way, Im sure my 17 year old will love it as its his Xmas present. The watch is a very manly large watch. It is bigger than I expected as the picture doesnt do it justice. The contrasting colours really make it stand out. I bought this as a Christmas present for my 15year old son. He will be delighted. A good quality watch. Im really pleased with it. Delivery was exceptionally quick. Looks good. Bought it for my son for Christmas so he has not worn it yet. Very happy with the watch, looks great. I needed it adjusting and was grateful to receive the voucher however, being located down in Torquay there was no place close to get this done. Never the less, fab buy, great dispatch time and well presented. BRILLIANT came day after ordering, will definitely be ordering again. When opening the box for the watch, I looked inside to see a beautiful piece of craftmanship it is a beautiful watch and is very comfortable to wear! I would definitely recommend! First time user of the Watchsop, found process easy and smooth. Good watch selection and prompt delivery for Xmas. Delivered quickly and really pleased with the product. The watch is as described, a lot nicer in person, it also looks a lot more expensive than it is. Definitely would recommend it as a Christmas present etc, my boyfriend loved his birthday present, also fast delivery too. Arrived within 2 days of ordering. Nice watch. Lovely product and received well. Well packaged so no damage occurs. Product is clean cut and legible. I was so pleased with this watch when I received it! Even down to then boxes it came in! It came in a lovely fresh box which was in another box to keep it protected. The watch itself was in mint condition all clean and shiny no finger marks which securely fitted in the box and it came with a manual book which is always helpful for a man! Very impressed. Worth every penny! Absolutely gorgeous watch perfect as a gift or for yourself. Thought this product would be very heavy but its not at all. Easy to open/close the watch strap but the only thing I found a bit of a struggle was setting the date as it was a bit fiddly. That aside though Im over the moon with it. A really lovely watch, very stylish and very good quality, looks far more expensive than it was. My son will love it. Beautiful watch, cant wait to give it to my boyfriend this Christmas! Very stylish and lovely packaging! Excellent , fast order and dispatch, the watch is perfect no scratches or marks would recommend the company to family and friends for future purchases . Keep up the good work Watch Shop 100% satisfied. My Son wanted a watch for his 16th birthday. He took his time and looked at many. then he said he had found THE watch. It was everything he was looking for in size, colour and design. I was pleased with his choice, as from an adults prospective it was a proper watch, no gadgets or gimmicks, just one nice looking mans watch. It looks great on him and I know he is extremely happy with it. Amazing watch, great design. Decent quality for almost half the price of House of Fraser Seen at £200. Great presentation box etc. Lovely, smart stylish watch.very good quality for money, looks even better than the pic. Watch face larger than expected but son loved it.bought for 18th birthday surprise. This watch is lovely the colour the style everything about it !!! Brought it for my boyfriends birthday cant wait to give it to him worth the money 1000%!! Would deffo order from watch shop again. Very large dial, looks good chunky heavy bracelet. Best price for item I could find. Only negative was could have had free next day delivery, as it was a last minute gift didnt want to miss post and have it go back to delivery office,so opted for store pick up. It didnt state when ordering how long it would be so I presumed next day but it was 48 hours so wasnt here for his birthday! 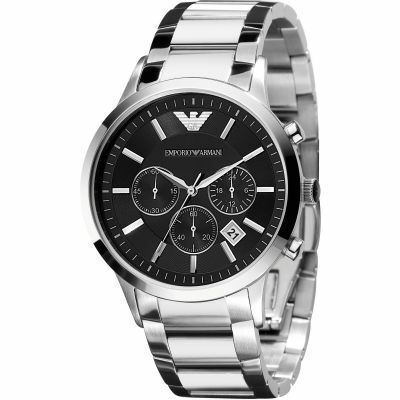 a watch for all occasions, stylish design with the Armani tag, great value and fast delivery. This watch is brilliant! My brother absolutely loved it when I gave it to him. Its very sleek and smart looking! Ideal for a young guy. The delivery for this was very quick and arrived exactly on the date it was estimated to. Very pleased with this purchase. This is a lovely product. I cant believe the efficiency of this company I needed a watch as a present and ordered it at 11pm and it arrived in the post 1 day later. Absolutely brilliant and the watch went down a storm! Thank you watch shop cant praise high enough and is my 3rd purchase and I am sure there will be more. 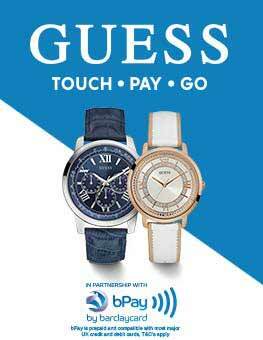 Affordable prices and the watches are lovely ! 2nd time I have ordered from here and many more to come. Bought as a gift, picture doesnt do it justice. Lovely looking watch and the receiver absolutely loved it. Stunning watch. Excellent price. Got as a gift for my partner who absolutely loves it. Very smart and sleek. Took the watch into Goldsmiths to have it adjusted to size. 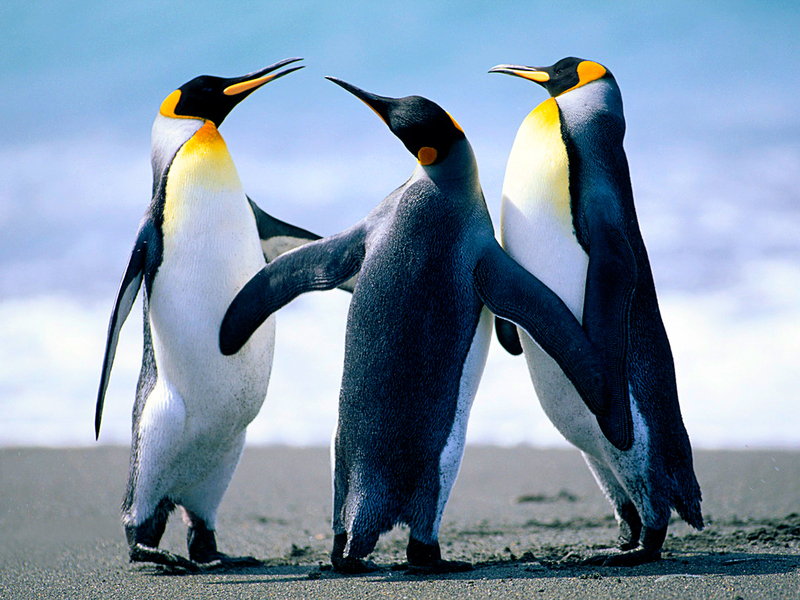 The staff were very helpful and done a good job. Thank you very much watch shop/goldsmiths. Will definitely recommend you to friends and family and I myself will no doubt buy from yourselves in the future. I bought the watch for my 14 year old son. We had links taken out and it fits perfectly. It look very nice. Impressed with the speed of delivery. Ordered one day and received the next. my order arrived promptly and I was very happy with the service. the product is in perfect condition along with the box. all in all very happy. Lovely gift bought for my boyfriends birthday, very striking appearance, could be used for casual or evening wear. Factory fitting was very large, would recommend having a link or two taking out for average man size wrists. Once again excellent delivery service as promised. 2nd watch I have ordered and product exactly as described. Delighted with the watch.. as described and quick delivery. Watch is perfect! 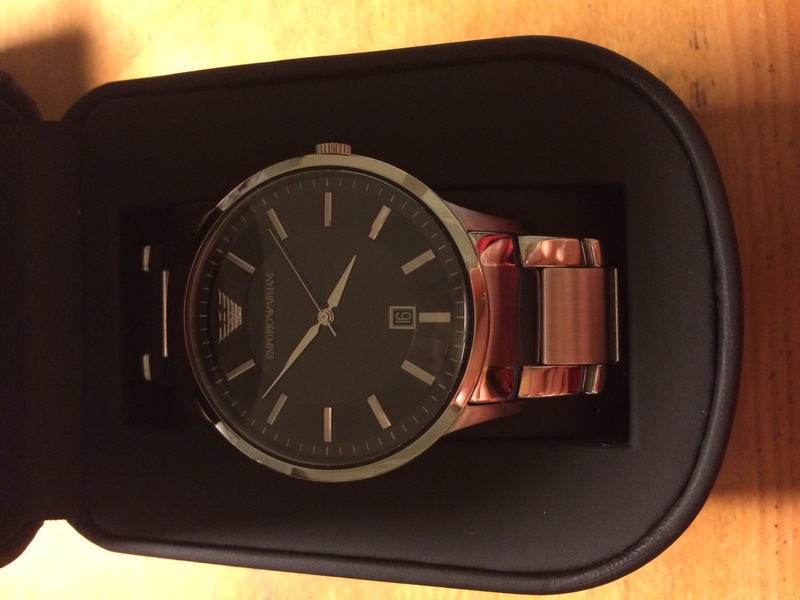 my purchase of my Armani watch was amazing it came the next day and i brought it for my partners birthday present, he was amazed how it looked and loves his watch thank you i will be shopping with you again and i will highly recommend you to friends and family. Amazing Watch, My Brother loved it! Brought this watch for my boyfriend for his birthday and he loves it! Very good quality watch. A fantastic product, professionally presented and in good quality. All aspects of the watch work and are clean, the lines are solid and clean, very comfortable and nice thin, professional watch. Excellent service and son more than happy with purchase- lovely watch. 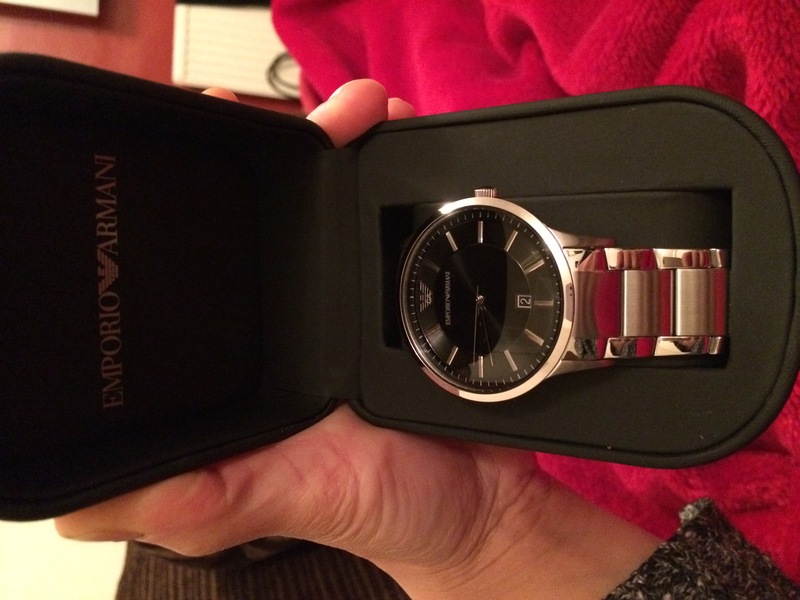 I bought this Mens Emporio Armani watch as an 18th birthday present for my grandson, which he absolutely loves. I looked at teh face size and thought it may be on the big side but it is great for him. Very well made and is a lovely, slim style. Very pleased all round. 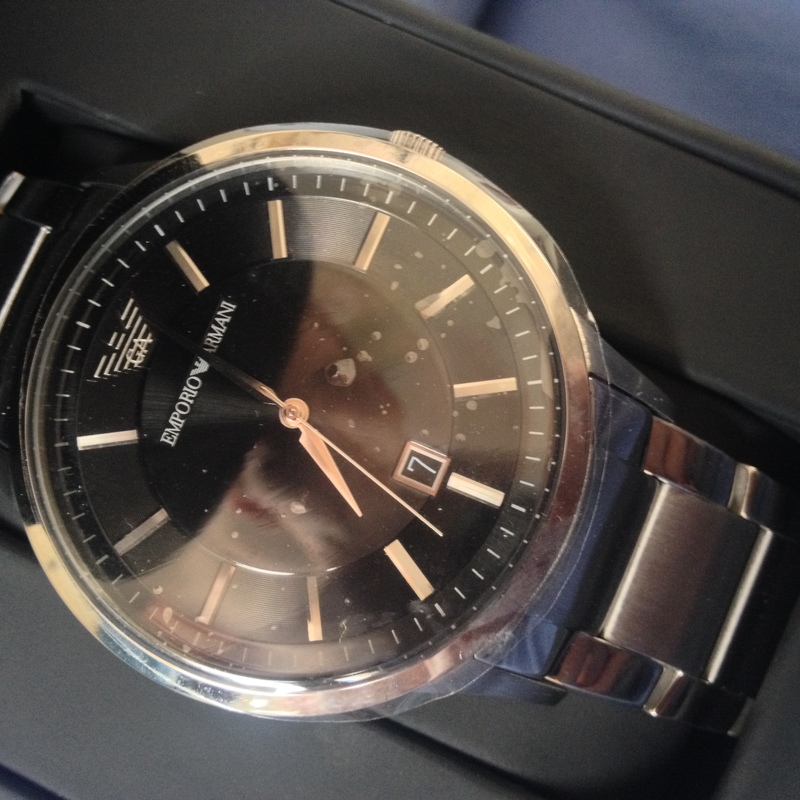 My Armani watch looked beautiful, it fit really well, it was excellent. Until one of the links broke and it fell off my wrist and now Ive lost it completely. This watch is faultless. If youre looking for something simple, well designed and that works perfectly this is definitely a great choice. The finish and the styling of this watch are excellent and for the price you really cant complain. For me the watch is the perfect size, the instruments on the watch face are clear to see and you can adjust the time/date with ease. Even though it has a metal strap the weight of this product is still very comfortable to wear and looks good with any outfit due to the colours of black and silver. Definitely a choice Im glad I made. 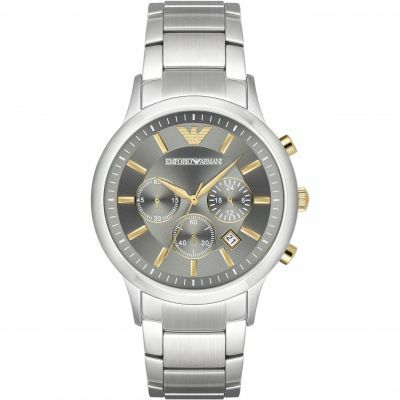 This Emporio Armani watch is perfect, great value for money and it looks incredible. I would certainly recommend this to anyone looking for a nice casual watch. Brilliant Vendor and delivered in exactly time. Best watch Ive purchased to date! 10/10. What an excellent watch! The watch is not heavy so fits on your wrist comfortably. The large clock face is just the right size to give the watch an elegant look and feel. The price is definitely in conjunction with the depth of quality you receive. I would 100% recommend this watch to anybody that likes good style and comfort. I brought this for my boyfriend for his birthday and he loved it. The watch was a perfect fit and looks really nice. We are both very happy with this product it makes a perfect gift. Nice looking watch, although is big for some wrists. Bought this for my boyfriend and he absolutely loved it. It feels great and looks fabulous on. We had to remove some links off as it was quite a large size but it was no trouble at all. The watch came in 2 boxes and an authenticity certificate and a user manual. Couldnt be happier with my purchase. 100% would recommend. Watch arrived in a really good time! Lovely product and such a good price!!! Bought this watch for my husbands 50th birthday, he loves it. Sleek and stylish. 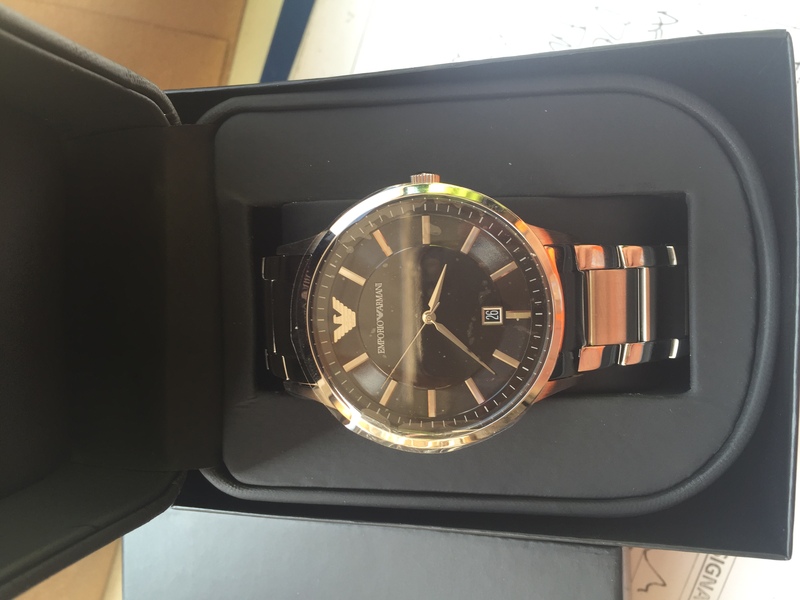 nice watch with genuine box and confirmation from Armani themselves. Disappointed about package left outside door and watch stop had been removed so battery is running. overall a good service. I really like this watch, it has a very simplistic yet smart design. The only down side is that it scratches very easily, Ive only had it a week and already have a scratch on it! If purchased take extra care. Looks amazing and feels great. Not to heavy fits nice. 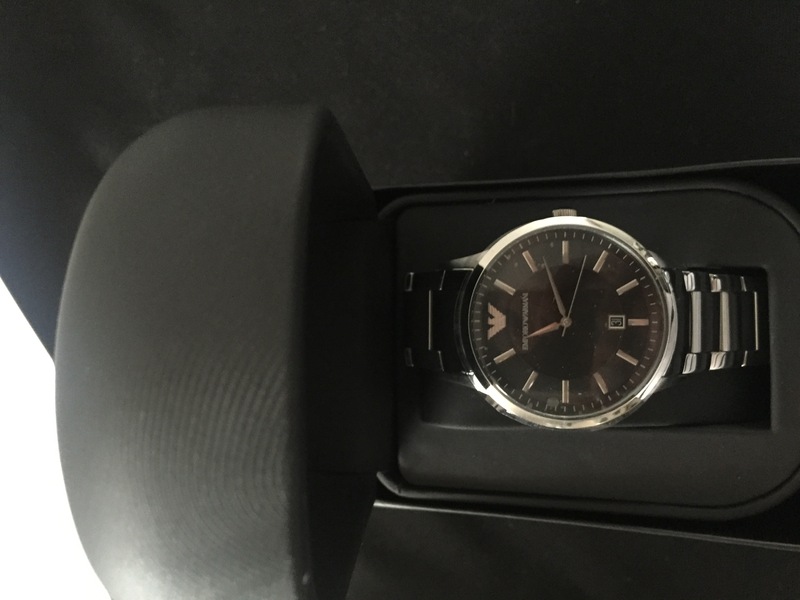 Bought for my sons birthday and he loves it,beautiful watch at a good price,had to take a couple of links out as it was too big for him but thats to be expected. Delivery was 1st class,arriving on time and on day I was told. Bought my husband for our anniversary. Beautiful stylish watch with a great price. Great quality product- very impressed. Amazing product ! Looks even better on arrival than the pictures show ! Have received nothing but compliments about my new watch. Very happy and very comfortable to wear . Absolute great buy ! Very pleased with my purchase. The watch is sleek and attractive - simply looks great and Ive received plenty of compliments. Great for everyday use or for special occasions. As well as the design, the weight of the watch and size of the dial feel as though youre wearing a quality timepiece. Fantastic service from the retailer - from ordering online to delivery, the purchase was quick and efficient. 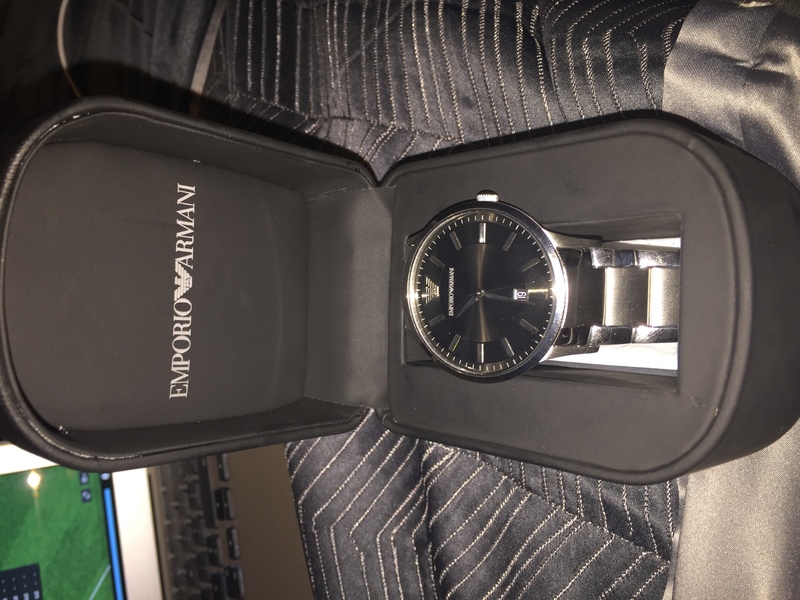 i bought this watch for myself and I always knew armani had good quality watches. first of all the price on watch shop was around 30 pounds cheaper than high street shops such as H.Samuels for the same product. The watch isnt too heavy on the wrist and really does make a statement with whatever type of clothing you wear. I wanted something that can look mature but at the same time stylish and ooze elegance and this watch definitely fits the criteria. Ive had many compliments and the estimation of price off some people was way over what I paid! The strap was a couple of links too big but thats easily adjusted for a couple of pounds which is worth paying considering the amount you save on the watch anyway. Delivery was quick and I was updated along the way up until delivery by email and text message. Genuine product authentication certificate is received with the watch. Definitely recommend buying this product! 100% satisfied! Great price.. Extremely happy with not only the watch! But the service and delivery too! The watch was exactly how I imagined it. Great condition, delivery was on time and I would definitely use this site for my next watch in the furture. Bought for my husband - the screen got a rated within months but its tiny so not a big deal. Great value for price and also recommend led to my sister who was also a happy customer! Bought for my son for his birthday who absolutely loves this watch. Face was slightly larger than expected so may look list on smaller wrists. Arrived within a couple of days of ordering. Just wish there were more local jewellers for us to get the strap adjusted at free. Great watch. Stylish, sophisticated and good value. The black face means it can be worn with anything. 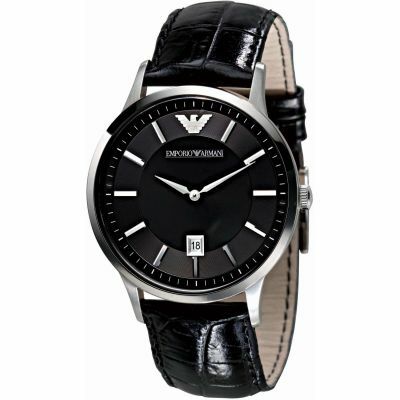 The black dial is dead sleek looking and gives it a sophisticated look! Definitely purchase this!! I am so excited to give my boyfriend this for his 21st!! Amazing watch looks so good and feels very comfortable I would recommend this to all. Amazing watch worth the price! Very good service. My nephew loves his first watch. He is a happy teenager. Which as you may know is a difficult thing to achieve. 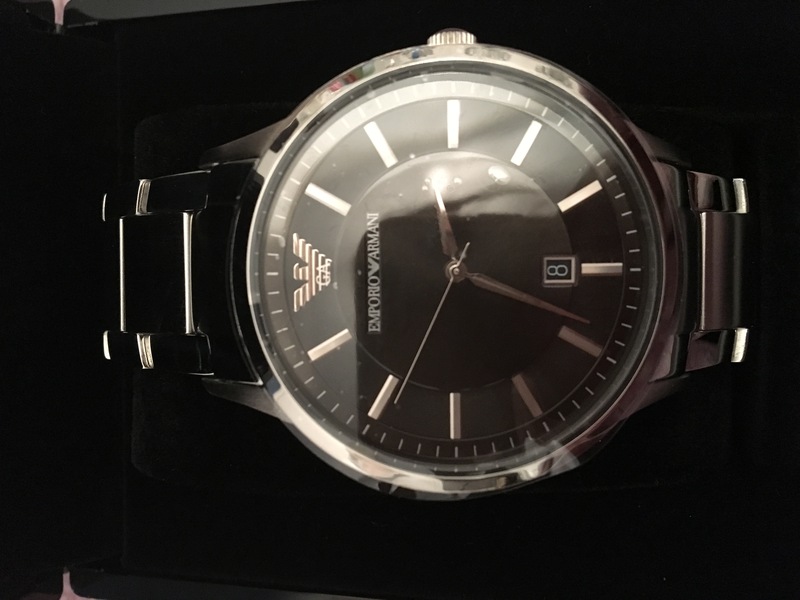 Mens emporio Armani watch.Brought this lovely watch for our sons 25th Birthday He was really pleased,Very smart looking watch with a black face and designer label and was reasonable priced.He has worn it on a few occasions and had some nice comments. 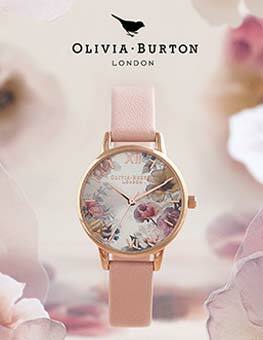 Gorgeous watch! Got it as a present for my boyfriend which he hasnt got yet but Im sure he will like it! As he is very fussy with watches and likes them with a large watch face. It arrived damaged but was quickly resolved! Beautiful watch! High quality, stunningly simple design. Brought for my sons 18th. I made this purchase with no input from my son as it was to be a surprise which is a risk when buying for an 18 year old. I was really pleased as it looks stylish & elegant with the black face and has clear clock face for ease of telling the time without being crowded with loads of other dials. The bracelet feels strong and sturdy and the size allows for a vey generous wrist if needed. It was altered with ease and now a perfect fit and the best news of all is my son absolutely loves it. Lovely product, great sized face with just enough of the armani logo to be stylish but not over the top. Bought as a gift for my husbands birthday, he loves it. absalutley beautiful watch, very well made, great fit, and made of very nice elegant metal that fits soft around your wrist. the watch looks very stylish and classy and makes a astonishing peice to wear with pritty much anything. high quality metal and able to wear for the whole day and doesnt irritate the wrists what so ever. 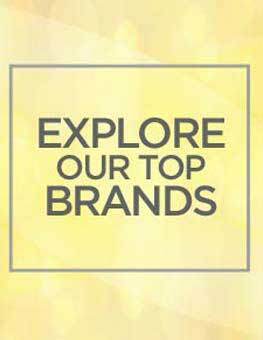 watch shop is brilliant online store and will recommend to everyone who i know that is interested in watches. watchshop isnt a want its a need!. Really lovely watch, looks even better than the pictures. Great price too! 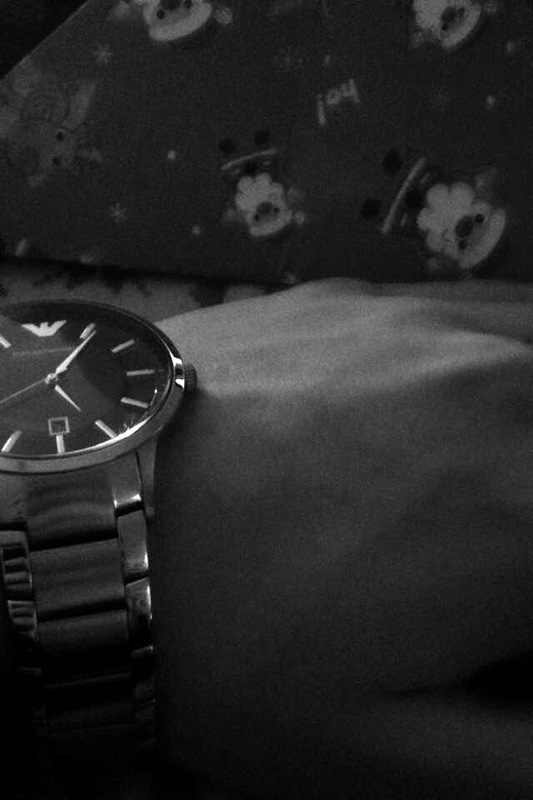 My son loves the brand Armani, loves the features of the watch. Large face is modern with a dark background. Sleek watch and at a good price! Lovely looking watch, nice metal bracelet with excellent weight to it. Feels like a quality watch with a excellent price. Well worth it. Nice Watch! Bought it as a gift for my brother, he really liked it!!! Amazing watch! I bought this watch for my boyfriend and he loved it! It is very elegant, stylish, and is the perfect size for a man not too big, not too small. The order was ok that I relieved however I did put in the measurement I wanted the watch to be, but still had to have it adjusted in town. But the product itself was satisfactory apart from that. 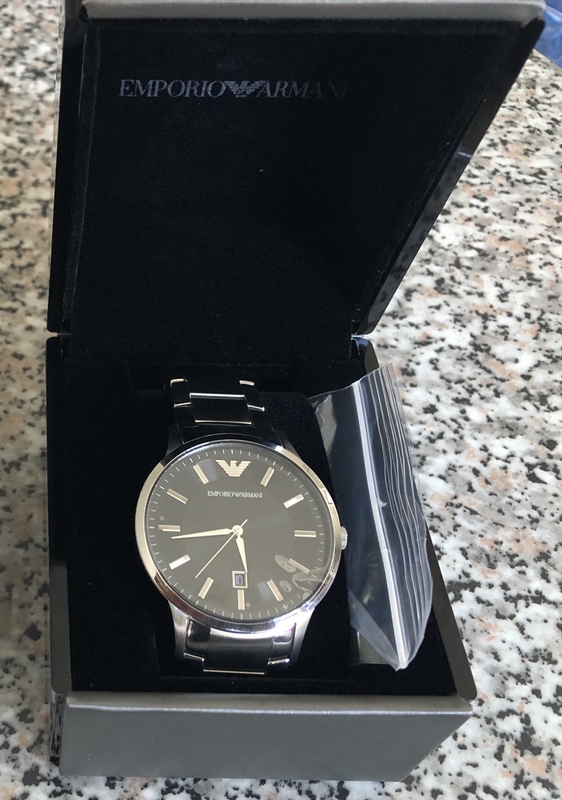 Bought this watch for my sons 21st birthday, it is a very stylish & smart looking watch which I hope will keep him in time for many years to come. Fantastic service. Amazing looking watch exactly what it looks like in the picture and fab packaging also! Cant wait to give it to my Boyfriend as it is a gift! For a birthday present at such short notice, the delivery was fast and the outcome was brilliant. Will definatley be buying from here from now on. Beautiful watch, fast delivery. Can securely packaged and no problems at all. Second watch I have bought from here, would definitely recommend and buy again from here. The watch arrived within two days and was beautifully gift wrapped, as it was a present for my son. We were very happy with the watch and the magnificent service. I would highly recommend the watch shop. 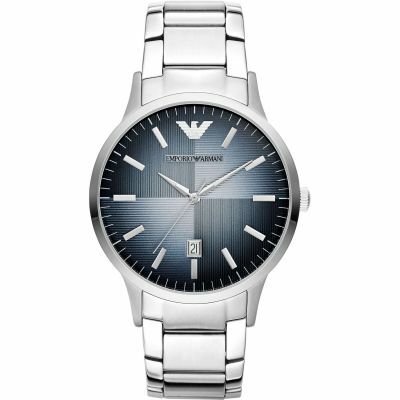 I have recently ordered an Armani watch from the Watch Shop online ! The price i paid for the watch was very reasonable and also it was the best offer Ive seen online ! Delivery time was also on point ! Fantastic buy, incredibly quality for price ! Extremely quick delivery. Very happy with the watch. Least expensive shop I could find, even the lady working in the jewellers said she used the Watch shop! Happy with my purchase, very good material and smart design. No bad comments needed. Nice big face and easy to read. Lovely. The ordering service was good, great choices available, delivery could have been better, even though it was Christmas time we expected next day delivery, that didnt happen however it came the next postal day. Very stylish, beautiful clock.Immediately eye-catcher. Delivery to Russia took 2 weeks. Im happy with my choice. Thank you so much !!!!!! 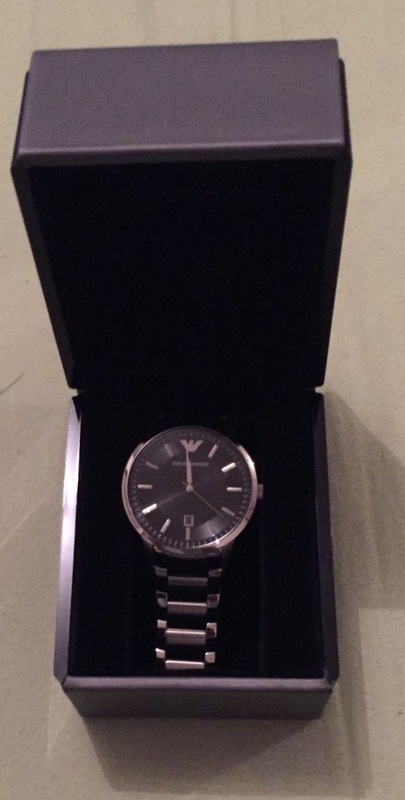 I ordered this watch for my brothers 21st birthday and it did not disappoint, he was absolutely delighted! Firstly, the watch itself is stunning. The black face with the silver markings match beautifully with the stainless steel strap. The watch is quite simple, but in a good way, you don’t have lots of unnecessary features like you get with some watches. It really is a stylish, sophisticated looking watch. It also comes in elegant looking packaging which is an added bonus! Although quite simple, the attention to detail is fantastic. 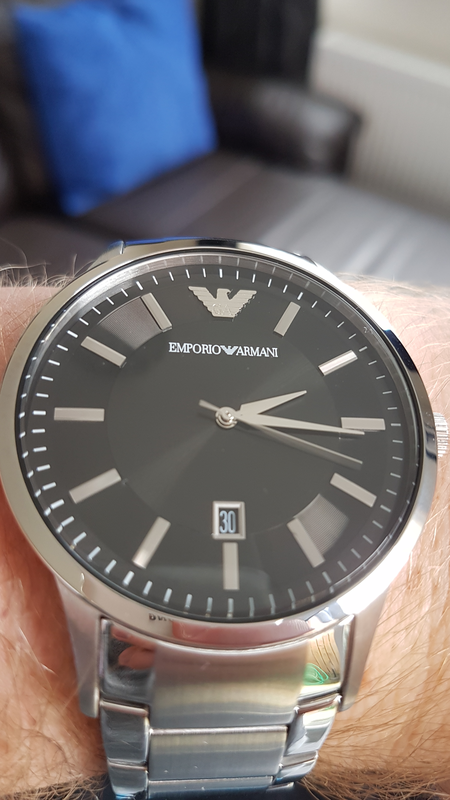 The logo and brand name on the face of the watch add a touch of class and there is even the Emporio Armarni logo on the button that you use to change the time. The date function is also a nice added feature, and it doesnt blare out at you like in some watches. The watch face is quite big, covering a large portion of the wrist, so if you don’t like big watches this might not be for you. However my brother says he likes this as it makes it super easy to read. The watch strap fastens easily and I actually think the colour of the strap is a nicer grey than shown in the online pictures. Not only is this watch brilliant but so is the service from the Watch Shop. I ordered the watch on Sunday and received it Tuesday morning. It was super fast delivery with email updates every step of the way, plus they offer free delivery and returns, helping to keep the cost down. I even sent them an email asking them a question and they replied the same day! 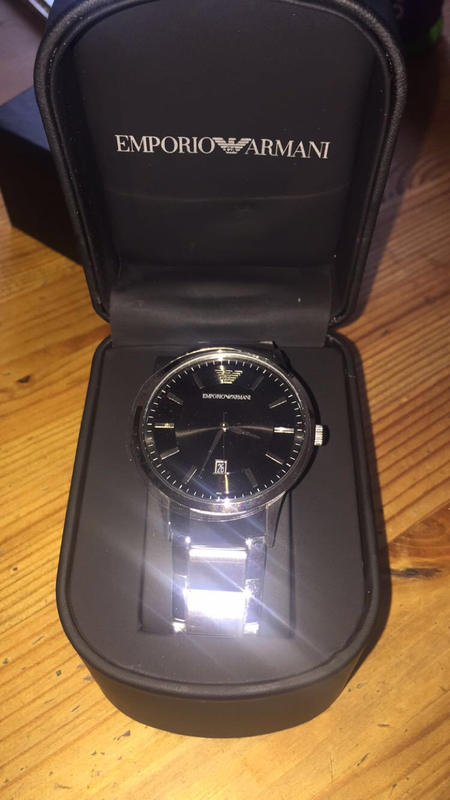 I would not have been able to afford this watch if I had bought it from a high street retailer, but thankfully for Watch Shops fantastic prices I managed to give my brother the best 21st birthday present, thank you Watch Shop, will definitely be ordering again from you in the future. Brilliant watch!!! Made a great gift for a friend! Bought as a new years present for my husband but having to return it as it is unsuitable for him although it is a beautiful watch such a shame. Excellent service and quality. The item was just as advertised and my son was delighted with this. It is slightly inconvenient to have to travel outside of my town to have it altered as it is too big. The nearest place I can get this altered for free is 20 miles away. I bought this for my boyfriend for our first Christmas together, he loved it, very stylish and classy looking, not too much detail, personally I love it! The black and silver combination makes it look fab! Kooks better in person! I bought this watch as a Christmas present for my boyfriend. I am always very dubious about buying expensive items online and having them delivered but as it was two days before Christmas it had to be done. The postage was around £6 for next day delivery and it was delivered by 10am the following morning. The watch itself was perfect. Exactly how I imagined it and better. The delivery was very swift and I couldnt be happier. My boyfriend loves the watch and I would definitely use watch shop again for other purchases! Excellent item, fast delivery and great price. Thank you! Great looking watch perfect present came even better than looked and tracking was up to date, watch needed adjusting slightly but not a problem to do,looks smart and more than I paid!! well recommend style looked smart I choose the black dial with silver as it looked for more classier then some other styles I viewed. My husband was pleased with the watch. But still early days! The price was steep knowing where they come from and how much they would have cost the supplier. An amazing piece of craftsmanship. The watch is not only heavy and durable, it fits like a dream, is an amazing brand at an amazing price, but the look of it oozes class and sophistication. The sleek metal strap is ideal for any man in a busy job who needs to look constantly suave, or for any teenagers birthday, special occasion watch etc. I gave it as a gift and it goes with all colours and outfits, not being too over the top but it is noticeable due to its amazing design. Very impressed! I bought this for my boyfriend and he was extremely happy with it. Its such a lovely watch, it can worn both casual and formal. Beautiful design. The watch is lovely, packaging was beautiful. Very smart. Large watch face which I like. Perfect really, abit big for my boyfriend but it probably fits the average. Well done watch shop! This was a Christmas Gift for my son, he absolutely loves it although he will have to have some links taken out before he can wear this. I was told I could take back to the shop and they will do this free of charge. Delighted with the watch itself, the speed of delivery and the adjustment which was made to the strap to fit my son. Love the design and look of the watch and mostly the price!! Product is excellent and received it really quick . Very pleased with the watch I order and arrived on time my son is going to love this gift. The watch as a whole has a classy and elegant look while still being undeniably masculine. It is suitable for all ages. The size of the watch is rather large however, this is not a problem as the bad is adjustable. The watch features both date and time which are simple to use. Cant believe how amazingly good quality and stunning this watch is. Purchased as a Christmas present for my partner and I cant wait to see his face when he opens it. The price I paid was unbelievably good value for money. It really is a beautiful watch... Clean cut and classic design. Im thrilled! I bought the watch for my husband for Christmas. I chose it for its elegance. I cant wait for my husband to open his present on Christmas day. I bought this watch and its faulty and I sent it back and I have not been contacted regarding my money or replacement. Great prices, gift wrapping was poor though. 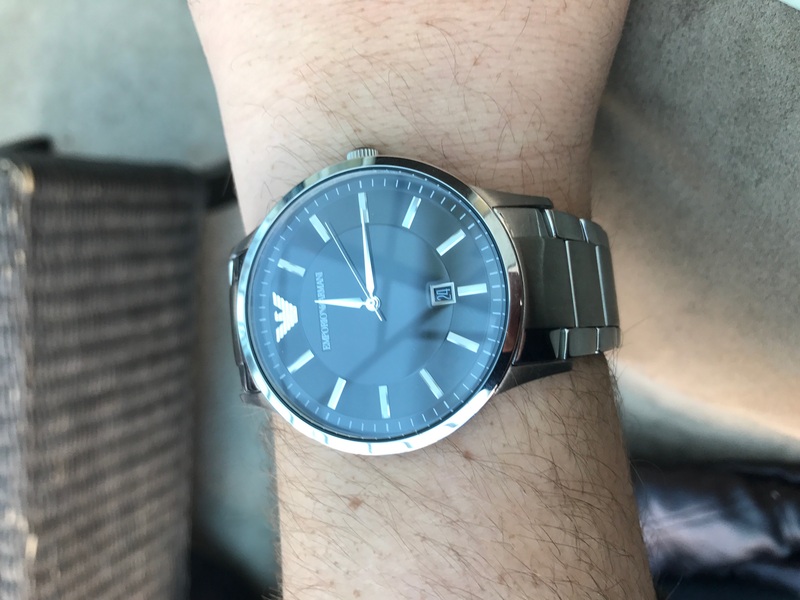 I recently bought the mens Emporio Armani watch for my boyfriends Christmas, after seeing how lovely it was online I couldnt resist. I received this watch only two days later, and was pleasantly surprised to see this watch was even nicer in person! I can not recommend the Watch Shop enough. Great service, easy online shopping, fast delivery and the most perfect Christmas present! Very nice watch, looks great on me. Arrived quickly as stated, easy payment process. Happy with product as described on website. Really happy with this watch, looks very smart. Great service with quick delivery. The watch looks great and with the 10% it was excellent value for money. 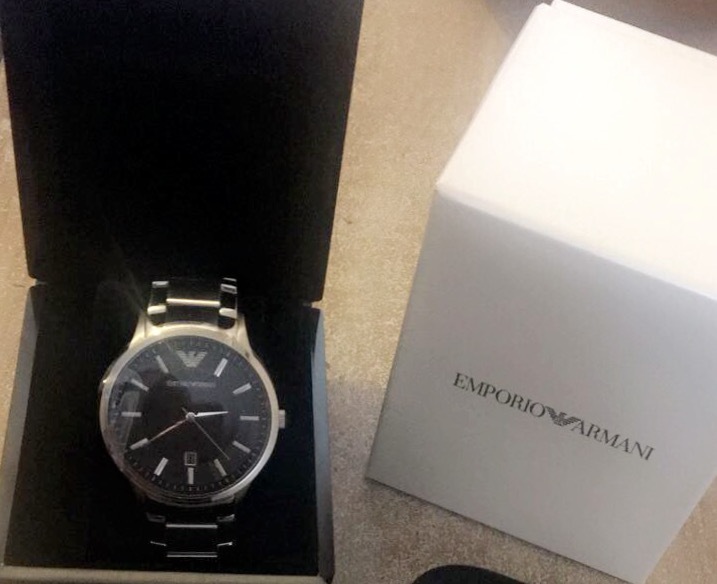 The Armani watch was a gift to my father, he honestly loves it as it goes with casual clothes and also suits, the watches face is a nice size its not too big and it looks very simple and elegant , if thats your sort of style then this is the watch for you surely! 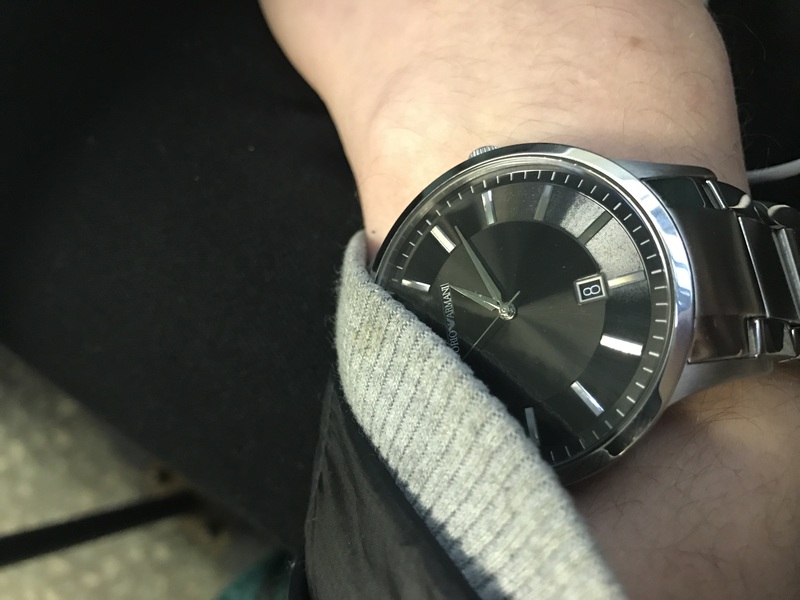 This watch is very thin and light, the black face makes it stand out and looks amazing on any wrist, would definitely recommend especially for the price well worth the money. Fast delivery, beautiful watch. Even better than the picture. I will have to get links taken out though, as I wasnt sure. Wish I added that on to my order at the start. All round excellent!! Quick delivery, perfect watch for a christmas present. Such good quality for the money, looks much more expensive than what it actually is. Dispatch and delivery were both fast, would recommend. I am literally in love with this item! 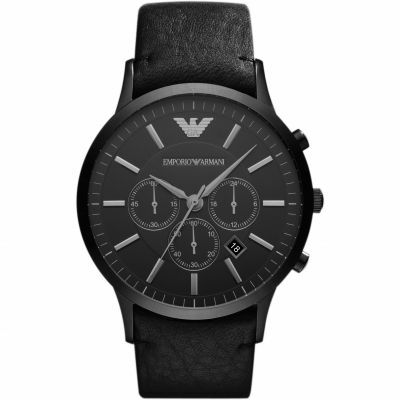 I bought it for my boyfriend as a gift for Christmas and I know he is going to be in love with it too, the face is perfect I love that it is a dark black and the silver is stunning. the style is really suitable for a man of a young age. Would recommend to anybody in their mid 20s! Bought this for my partner. It arrived very fast. Packaged well and really is a gorgeous watch. Very happy! Absolutely amazing watch, fits perfectly on the wrist, very sleek and classy, nice big face 44mm in diameter to be exact, the fact the watch shop take the links out for you is a massive plus side too, and its incredibly cheap for a watch of this standard, alongside free delivery!! You really cant go wrong with this, fantastic experience!!! 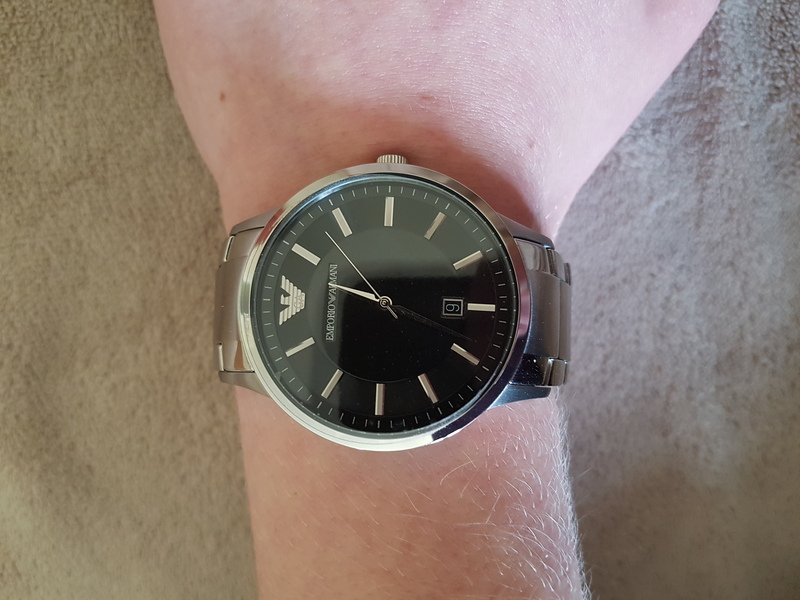 I purchased this watch for my sons 18th birthday and he was over the moon with it the links were easily removed from a local store the watch fits and looks perfect on my son even having thin wrists. The watch face is large and black and stands out great with chrome bracelet, the clasp connection is fantasic opens lovely. Excellent purchase. I am very pleased with the look of this watch, it has a very clear face and the wrist band is neat and exceptionally sturdy without looking heavy.it looks ideal for my 18 year old grandson. the new owner and myself were more than happy with the product. Really classy, good quality, some space for engraving on the back. I like the simplicity of the watch face, made a great present! I recently bought this as a Christmas present for my boyfriend. Im very happy with my purchase. The face is big and easy to read and feels of good quality. Lovely great value for money watch..
My hubby loves it .!! Watch is beautiful . I bought this as a present for my boyfriends 25th birthday . He loves it . Looks elegant and very expensive . This product is of excellent quality. The product appears just as described and is a smart, well produced item. The recipient was very happy with the product. Watch looks great and feels great. Its a great watch, extremely comfortable and looks great! Arrived very quickly and exactly as expected in terms of look and quality. Was pleased with the speed of the service. My son is very proud of his new watch! Gorgeous watch, high quality. The watch screen is a good size and really clear! Brilliant quality, quick delivery, easy to process & one happy boyfriend! Bought this watch for my sons 16th birthday present and he is very happy with it. The quality is fantastic and looks great too. The clasp mechanism on the bracelet is very ingenious as it allows the wearer to easily put it on and take off without any effort. Overall and very nice and stylish looking watch. Good quality watch. Had it delivered to Goldsmiths store who fitted the watch to my wrist there and then.